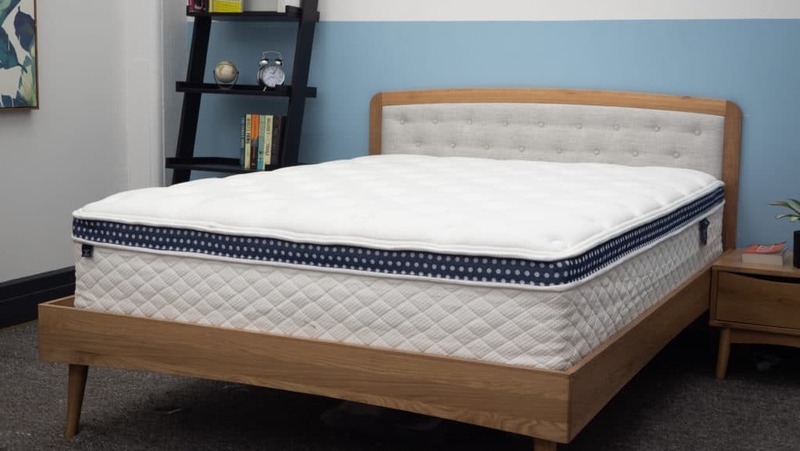 WinkBeds Mattress Review 2019 Update - Same Support Now In A Bed in a Box? Today I’ll be diving into the original WinkBeds mattress, a hybrid model that combines a plush pillow top with ultra-supportive coils for a super cozy sleeping experience. Aside from checking out its specs, I’m excited to scope out this model because it’s the brand’s very first bed-in-a-box. This bad boy measures a mighty 14” from base to cover and contains a gel-infused cooling layer amidst its many coils — but can it offer just the right comfort and support you’re looking for? I won’t know until I peep the scene for myself. Join me as I put it to the test to find out if it could be the mattress of your dreams! 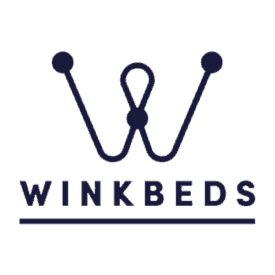 WinkBeds was founded in 2014 with a simple mission to create high-quality mattresses using eco-friendly, American-sourced materials. 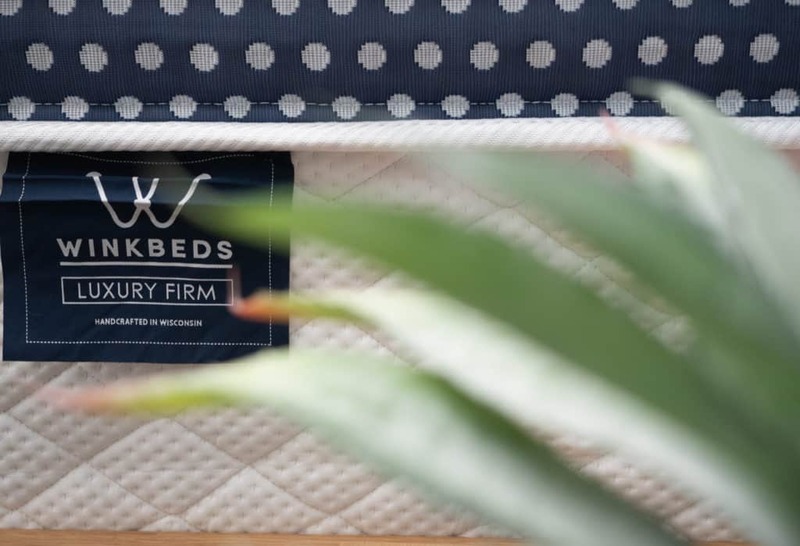 After perfecting its original mattress (which I’ll be assessing in this review), the brand moved onto the WinkBeds Plus, designed specifically for heavier individuals (my review of which you can check out here). 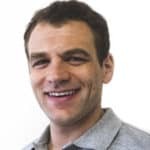 For more on the brand’s history, take a peek at our interview with WinkBeds founder Dan Adler. While WinkBeds stands out as one of the most popular hybrids on the market, it faces some pretty steep competition from Saatva and DreamCloud, both of whom produce luxurious hybrid models at affordable prices. I’ll shed more light on these competitors later on in this review, but for now let’s zoom in on the construction of the WinkBeds mattress. 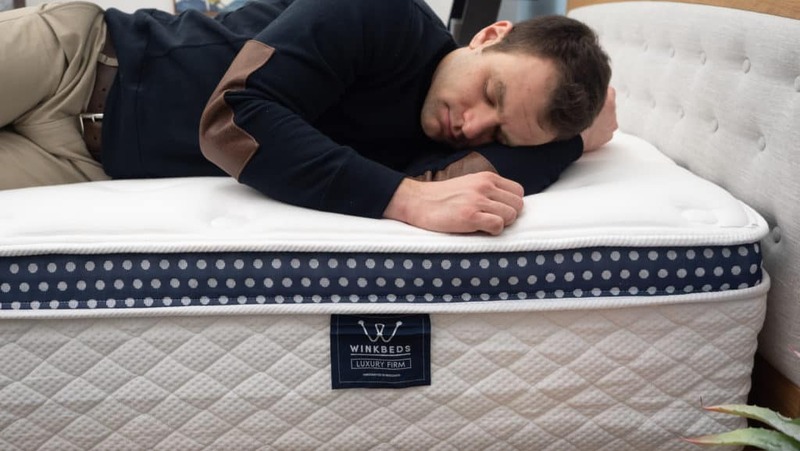 The original WinkBeds mattress is a fairly hefty bed featuring 4 layers of pressure-relieving foam, microcoils, and pocketed coils. This combination of materials results in a bouncy and highly supportive structure that also happens to sleep extremely cool. Customers can choose from a range of firmness levels, but for this review, I’ll be focusing on the Medium Firm version. But enough talk for now — let’s dive in and explore what makes the construction of a WinkBeds mattress so unique! COVER – The cover is made of Tencel, an all-natural, eco-friendly material made from eucalyptus wood cellulose (that’s right: eucalyptus wood cellulose). Lighter woods such as eucalyptus and bamboo are known for being light and breathable. Quilted detailing also provides pressure relief and a bit of soft sinkage right off the bat. EURO-PILLOW TOP – Comprised of gel-infused foam, this comfort layer is smooth and luxurious to the touch, but retains a fair amount of firmness and support. While regular foam has a tendency to overheat, the gel in this foam layer keeps things cool by lowering the temperature of trapped body heat. The gel-infused foam lies just beneath the Tencel cover, dispersing warmth from the top cover throughout the rest of the mattress. Think of the Tencel as the yin, and the Euro Pillow Top as the yang: the two layers work together to keep you cool and comfy as you snooze. BOUNCE – This bed’s bouncy support layer consists of soft-but-sturdy microcoils, giving the mattress its uniquely cushy combination of softness and support. Microcoils are made from thinner and more flexible wire than, say, pocketed coils, and they provide a much greater feeling of pressure relief between the top and bottom lawyers. This microcoil support layer helps the sleeper avoid that pesky feeling of being “stuck” in bed or sinking too far into the mattress. FOUNDATION LAYER – Lastly we come to the foundation or base layer, composed of a whopping 8” of pocketed coils. These pocketed coils are zoned into seven sections that provide different firmness and pressure relief at different contact points along the body as you sleep. Essentially, you’re getting more sinkage at the shoulders and hips, but more support and firmness to cradle your spine and lower body. Another feature of note here is that pocketed coils are individually wrapped, which provides a bouncier and more breathable feel than traditional steel coils. Now that we know how a WinkBed is made, let’s see how a WinkBed really feels. Since we’re all different sleepers with different ideas of what makes a bed truly great, I sought out some friends to help give the fullest picture possible of the WinkBeds experience. I decided to bring in three other testers to check out the WinkBeds mattress. We each took a turn lying on the mattress and gave it a personal rating, and finally I compiled the ratings on the graph below. 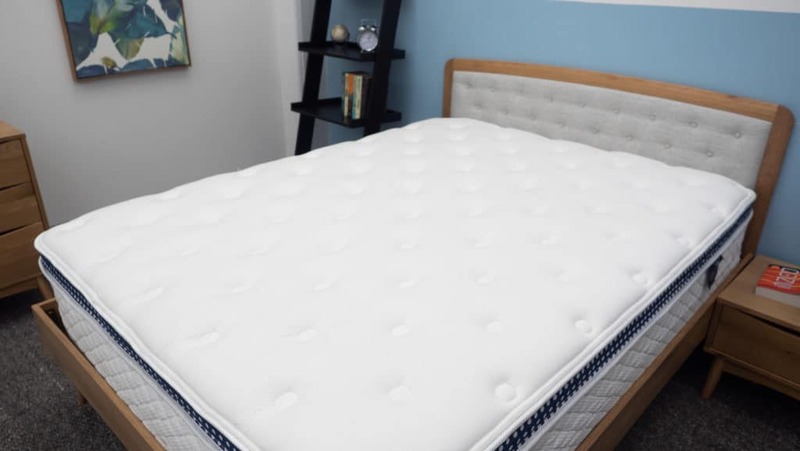 While the way a mattress feels will inevitably vary from person to person, our responses can provide you with an approximate idea of the firmness range you can expect from this bed. (As I mentioned earlier, this WinkBeds model is available in a range of firmness levels, including Plush, Medium and Firm, as well as a Plus model for heavier folks. For this test I chose the medium). As you can see from the graph above, this medium firm mattress is aptly named, falling just on the higher end of the medium firm range with an average rating of 7. Compared to the industry standard of 6.5 for medium firmness, this bed is a tad on the firmer side. That being said, I think the cushiony resistance of the microcoils combined with the light, airy bounce of the top cover would make this a perfect mattress for combo and stomach sleepers, or anyone who needs to change positions frequently throughout the night. On the flip side, side sleepers may find the bed too firm for their specific needs (i.e. pressure relief at the shoulders and hips). One feature that should always be considered when buying a new mattress is pressure, or how the bed will feel against various pressure points of your body as you sleep. Side sleepers, for example, typically experience pressure at the shoulders and hips, where they sink a little more into the mattress. To help get a better grasp on this model’s potential pressure points, I placed a pressure map on top of the mattress and measured the pressure on my body while lying on my back, stomach and side. You can see the results on the image below where pressure is represented from blue (low pressure) to red (high pressure). Back – Stretching out on my back, I felt the top layer was soft but very supportive. Unlike a memory foam mattress, I didn’t feel enveloped in the bed, and found it easy to move around and switch positions. My weight was evenly distributed, and as you can see from the graph, I experienced almost no pressure in this position. Side – Rolling onto my side, I could feel some slight pressure forming at my shoulders and hips. Pressure at these contact points is typical with firmer mattresses, and the WinkBeds is a fairly firm structure (again, scoring about a 7/10 on the firmness scale). 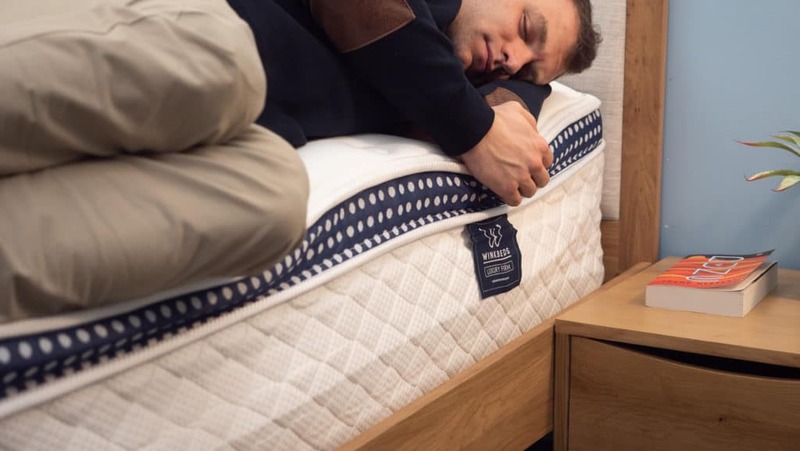 This particular model is probably not the best mattress for side sleepers, who generally need deep body contouring and sinkage to stay comfy through the night. I recommend the WinkBeds Soft model for side-sleepers who need a little extra support. Stomach – Switching to a prone position, I found that lying on my stomach was much the same as lying on my back — my weight was evenly distributed with very little tension. I felt well-supported at the hips, a necessity for stomach sleepers to prevent the lower body sinking out of alignment and creating tension in the spine. It’s worth noting that heavier folks may want to look to the firm or plush version of his mattress, depending on preference. 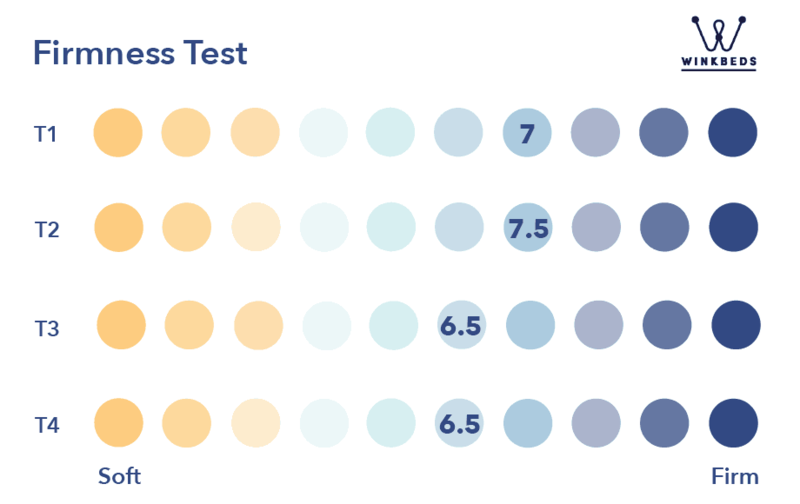 Since every mattress is unique, comparing mattresses from different brands can sometimes feel like comparing apples to oranges. But the WinkBeds mattress has a couple of noteworthy competitors who offer similar models, so I thought we’d take a look at those competitors and see how the WinkBed differs. 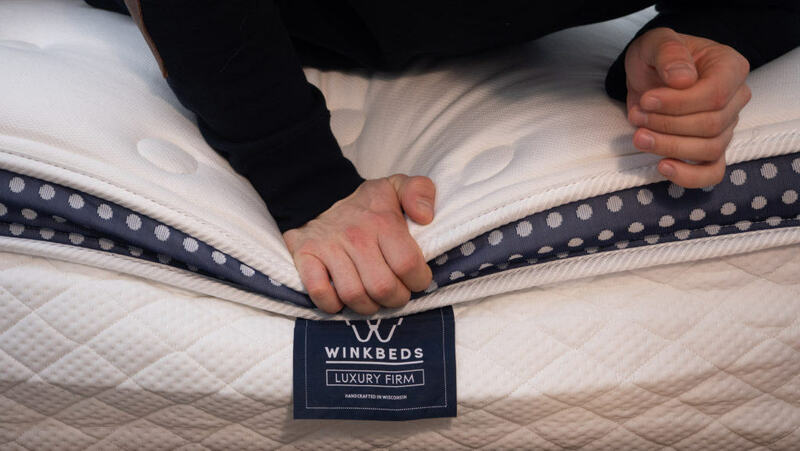 Knowing what does (or doesn’t) set the WinkBeds brand apart can help you as you navigate the mattress-buying process. The WinkBeds closest competitors include Saatva and DreamCloud, two brands offering luxurious hybrid mattresses at similarly affordable prices. Like WinkBeds, the Saatva model features a coil-on-coil structure for strong support and an organic cotton cover for breathability. However, the Saatva is not a bed-in-a-box model. If you like having a lot of options for back support, you can still have your pick of three firmness levels with Saatva: Plush Soft, Luxury Firm, and Firm. Environmentally conscious shoppers should note that Saatva is even more eco-friendly than WinkBeds, with innersprings made from recycled steel, and plant-based renewable foam layers. For those looking to save a few bucks, the Saatva is more budget-friendly than either the WinkBeds or the DreamCloud, priced at just $1,099 for a Queen. Learn more in my full Saatva review! 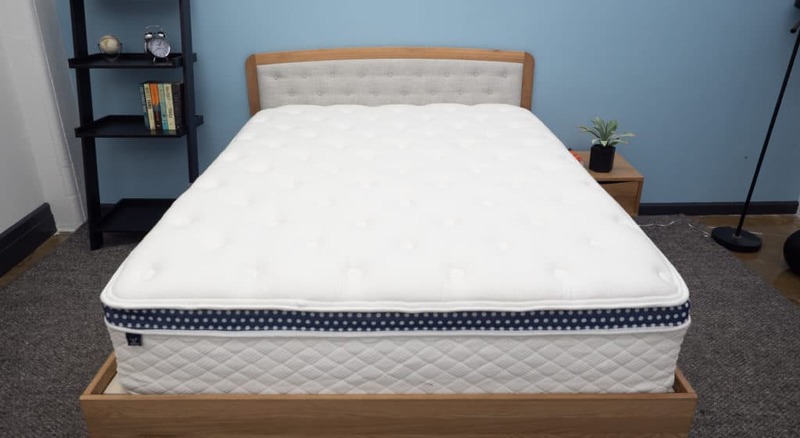 The DreamCloud model, meanwhile, is a bed-in-a-box that opts for memory foam layers instead of coils, but is a bit firmer overall. Measuring a whopping 14” from base to cover and containing twice as many layers, the DreamCloud is better suited for those seeking a more luxurious experience. However, unlike WinkBeds, not all of those luxurious layers are eco-friendly. The DreamCloud features additional edge-support, which is great for sleepers who gravitate away from the center of the bed — no need to worry about falling off the bed! If budget is a concern, you might find the DreamCloud a little easier on the wallet, clocking in at $1,199 for a Queen. Check out my full review of the DreamCloud for a deeper dive. Sinkage is a great measure of a bed’s overall softness and pressure-point relief. A good sinkage test can give you an idea of the bed’s support in different sleeping scenarios, and how the bed might feel for different body sizes and types. To demonstrate this bed’s sinkage, I placed four balls of varying sizes and densities (a 6 lb medicine ball, a 10 lb steel ball, a 50 lb medicine ball, and a 100 lb medicine ball) on the mattress and measured how much they compressed the surface. The six, ten and fifty pound medicine balls produced a bit more sinkage than I would have expected, given the sturdy support layers. This is largely due to the softness and flexible material of the pillow-top comfort layer. 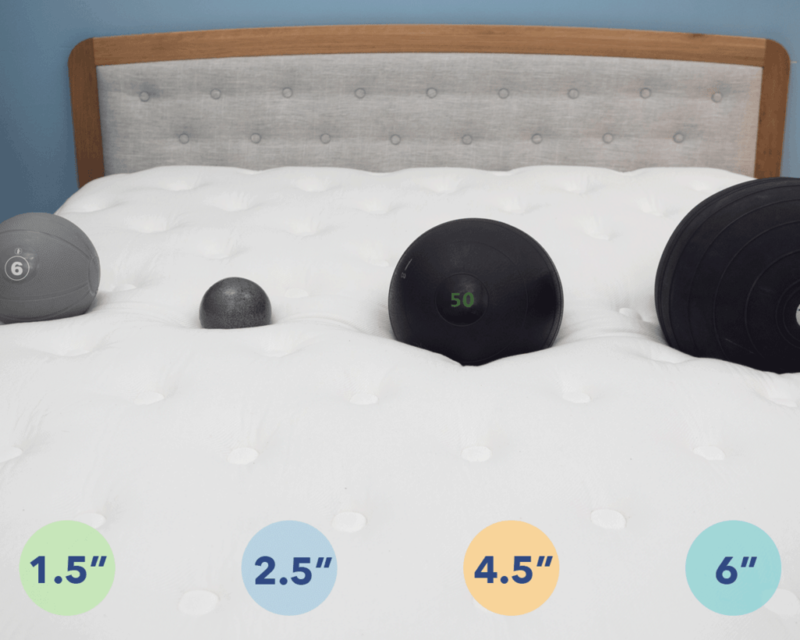 The 100-pound ball, however, produced average results compared to other mattresses, which makes sense considering the bed’s firm foundation layer of pocketed coils. If you’ve ever shared a bed with a partner or a pooch, you know how important motion transfer can be in a mattress. 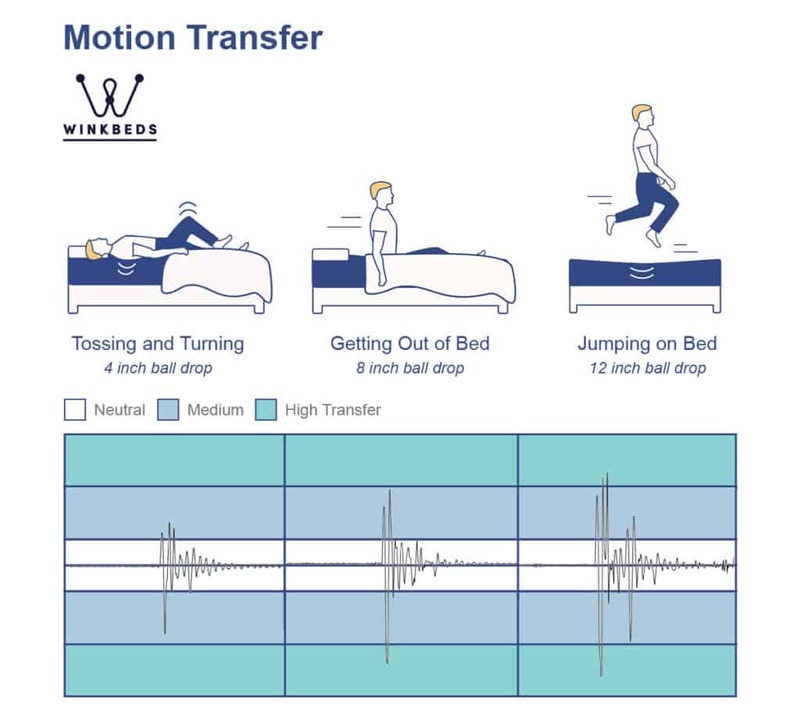 Motion transfer is essentially the amount of movement that travels through the mattress when touched or disturbed. No mattress review would be complete without a good motion transfer test, so read on to see how this bed measures up. To illustrate this motion transfer, I dropped a 10 lb. steel ball from heights of 4 inches, 8 inches and 12 inches and measured the disturbance it caused: the bigger the lines on the graph, the bigger the disturbance. FYI: Each drop is meant to symbolize a different movement you’re likely to experience in bed, from light tossing and turning (4”), to getting out of bed (8”), to full-on jumping (12”). 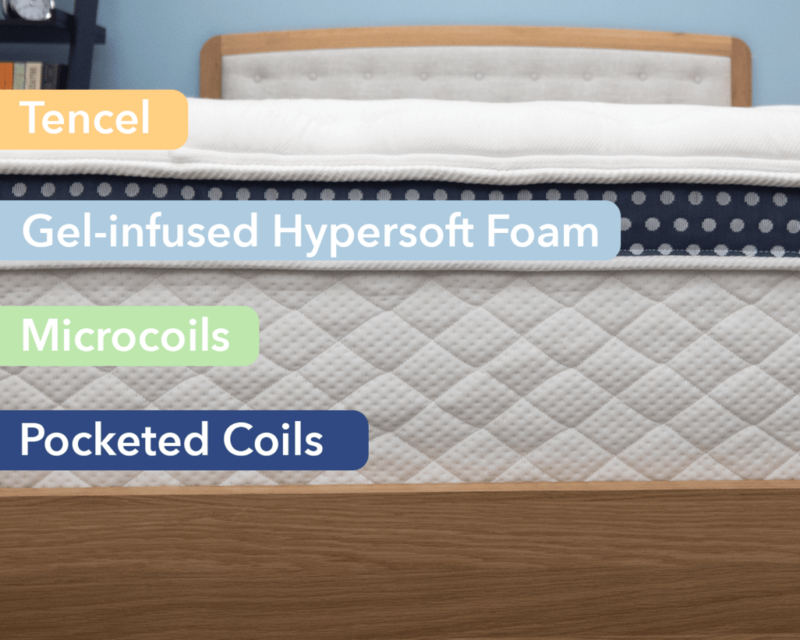 Because this bed is comprised almost exclusively of bouncy, breathable coil layers (with plenty of airflow between coils), it is highly sensitive to motion. Small disturbances aren’t likely to disrupt your slumber with this bed, but big movements like jumping are easily felt. If you’re a light sleeper looking for a bed that absorbs motion, you might want to check out a bed with less bounce and more sinkage, such as a memory foam or dense foam model. SHOULD YOU BUY A WINKBEDS MATTRESS? So now that we’ve fully explored the WinkBeds mattress, you might still be wondering if this is the bed for you. Trust me, I know all this information can be overwhelming! To help you out, I thought I’d give a quick down-and-dirty summary of the bed’s pros and cons, and highlight the kind of sleeper who might find this mattress ideal. Combo sleepers rejoice! The bounce of the coil-on-coil construction should allow you to switch sleeping positions with ease, while still providing a little bit of cushion to support pressure points. For fans of a more traditional innerspring feel, this mattress definitely evokes that classic, bouncy vibe. If you tend to sweat while you sleep or overheat at night, this bed’s cooling capabilities, breathable comfort layers, and coil-on-coil design are sure to help you beat the heat on even the warmest nights. This bed’s bounciness and buoyancy do make it super susceptible to motion transfer, so you may want to consider a less bouyant mattress if you sleep with a partner or pet. Likewise, the sturdy support structure and coil layers mean this bed doesn’t provide as much contouring or sinkage as a memory foam or foam-based mattress. For more information on the WinkBeds mattress, visit its website here! While you’re doing your research, note Winkbeds made the best mattress picks on Mattress Clarity as well! Classic innerspring build. Uses a european style pillow top of memory foam and soft poly foam for pressure relief. The support comes from a pocketed coil system that is encased in a HD Poly Foam Edge Support layer. Overall produces a medium feel mix of comfort and support. Last year I bought a Wink mattress for my son. I was very pleased. This year I order one for myself and my husband. What a disaster. The mattress came rolled up. No mattress that can be rolled can be any good when it comes to support. I haven’t even put it on the bed frame. It is going back as soon as they can send me the necessary paperwork. I am so disappointed. They need to let people know that they are now rolling their mattresses or they are going to have a lot of returns. The title says your review was updated on Jan 29, 2019 but there have been some MAJOR changes coming into 2019 that you do not mention. I’ll call it WinkBed 2.0. 1- The support coils are no longer encased with foam, the steel coils go right to the edge. I don’t know if it’s the same coil on the edge as in the support area and I don’t know if this is good or bad, I need to see a demonstration. 2- The mattress is now roll packed and shipped. This is a major change as it goes against their original philosophy of NOT compressing and roll packing their mattresses “in order to preserve the integrity of the materials we use”. 3- Trial period is now 120 days not 101. 4- They now offer a Lifetime Warranty replacement, it used to be 10 years. Incredible! 5- They now offer a Lifetime comfort guarantee. 6- The fabric on the sidewalls is different. From the limited number of images online, I cannot tell if this is an improvement or not. Do you think you can do an updated review of the new WinkBed soon? Reviewers of Winkbeds are not being honest about the smell of the mattress. I received my Winkbed Soft King Size about 4 days ago. The smell is awful. After one day, I removed all the sheets, opened up all the windows, and let it sit for 24 hours. No noticeable improvement. If I don’t keep the windows open, the entire bedroom has this awful odor. Not sure how long it is going to take for this to go away – but buyers should be aware of it. The mattress itself is quite comfortable. Can you tell the difference between an all-foam and a coil-hybrid style for comfort? I seem to recall that during my last mattress buying experience, I did prefer the mixed feel. This was one of the TemperPedic models. My wife insisted on the pure foam version, but the hybrid felt like a nice compromise. The pillow top appears to be an attractive option for added comfort too.